The conflict between elephants and humans has been escalating. With forests widely encroached, elephants are forced to stray out of their habitat and sometimes destroy paddy fields, prompting attacks by villagers. A day after the elephant was officially declared a Heritage Animal, entitling it to the same sort of protection as the tiger, villagers in Assam, India; beat a baby elephant to death in the most brutal manner. This three year old baby elephant calf, which was injured and had been abandoned by his herd, was brutally tortured to death by a mob of around 200 villagers armed with sticks, bamboo poles, and ropes that went berserk charging the baby elephant. The incident was filmed as the mob killed the calf in front of two armed security guards. 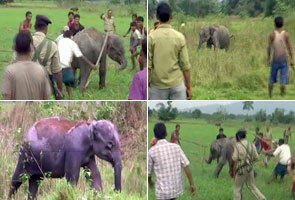 A fortnight ago, four elephants were found dead in tea gardens near Kaziranga. Experts said they seemed to have been poisoned. Look, who is the animal ! Similarly, tigers, leopards, elephants, deer and rhinos have been either poisoned or shot dead by villagers and poachers alike in the past. Most of these animals are killed for their skin or tusks. Many cases of killing of these animals have been reported, however, most of the them go unreported. This mindless violence against innocent animals needs to stop immediately. This world belongs to animals as much as it belongs to us. It’s us humans, who have encroached upon their territory and we have no right to kill them.